Houston’s The Tontons (Adam Martinez, Asli Omar, Justin Martinez, and Tom Nguyen) have been making some waves recently ahead of their Pop Montreal appearances later this month, and have just released a video for “Golden” off of their latest EP (which you can stream here). 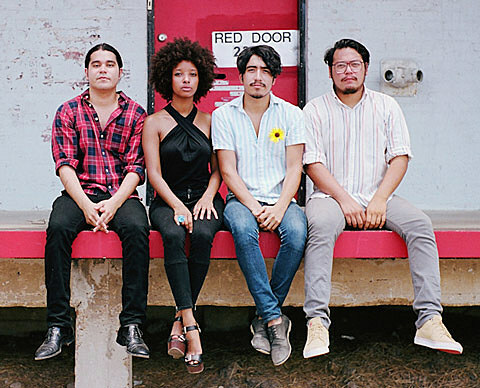 (Houston, TX) Houston-based indie rockers The Tontons are pleased to announce the release of their new music video for “Golden” from their most recently released EP, Golden. MTV’s Buzzworthy blog raved about “Golden” making comparisons to Metric and front woman Emily Haines while Austin’s NPR affiliate KUT deemed it “Song Of The Day”. Upon hearing the MTV news, rap legend Bun B announced The Tontons as the “Best Band In Houston” to his 550k+ Twitter followers. Extremely grateful for the recent recognition, The Tontons are stoked to share with the world the visual that accompanies “Golden”. Written and directed by Tom Adams and Tom Nguyen. The Tontons visit Austin often and will be back on October 29 at The W Hotel, following performances at CMJ and touring down the East coast. Check out the new video, as well as full tour listings for The Tontons (including Pop Montreal and CMJ dates) below.